Oh, those are just too cute! And useful! 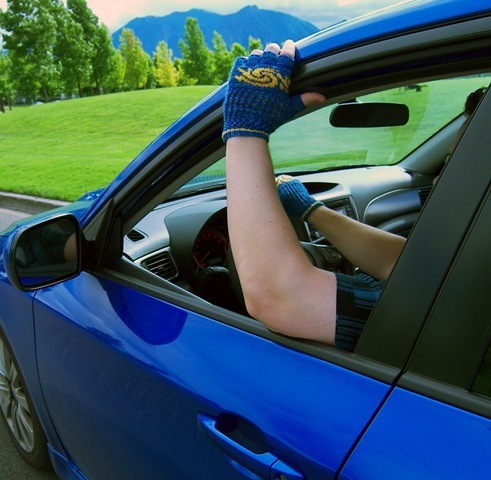 Gloves to match the car: nice! 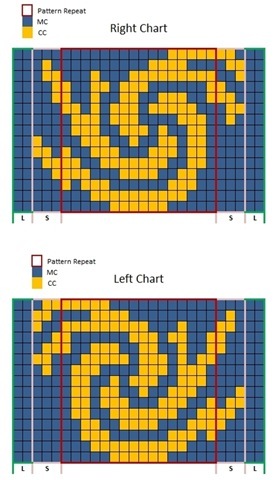 Are there any published errata for this pattern? I”m finding a few problems as I try this out for my husband. 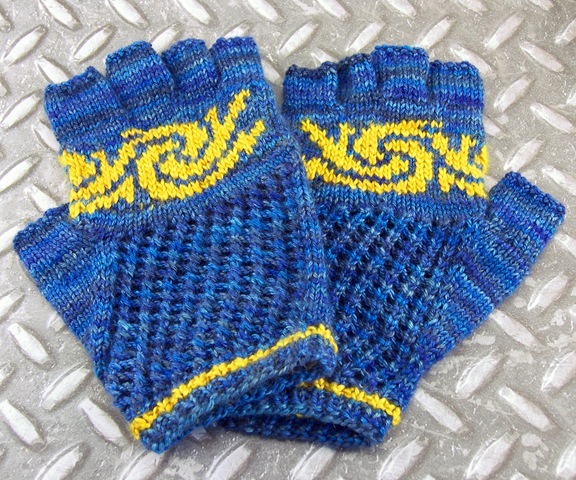 I’m not using the colorwork chart, but on the left glove, round 8 is repeated twice. The first is a cut and paste from the right glove, I believe that the second is the correct increase round. Also on the left glove it states to repeat 9&10 2x, however on the right it was once for the small and twice for the large. 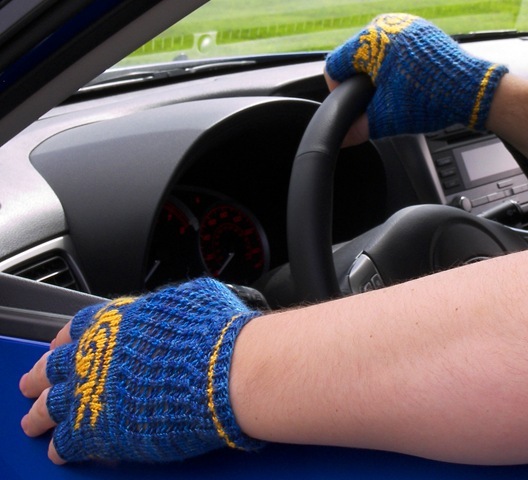 And, I’m guessing here, but I would assume that the thumb increases for the left glove are opposite the right (M1L first, knit, M1R), but the pattern has both gloves increasing the same. This is as far as I am on glove #2, but I thought I’d ask the questions as I went. Thanks for pointing out those errors! I’ll put the first two down as typos and I apologize that my proof-reader didn’t catch them. 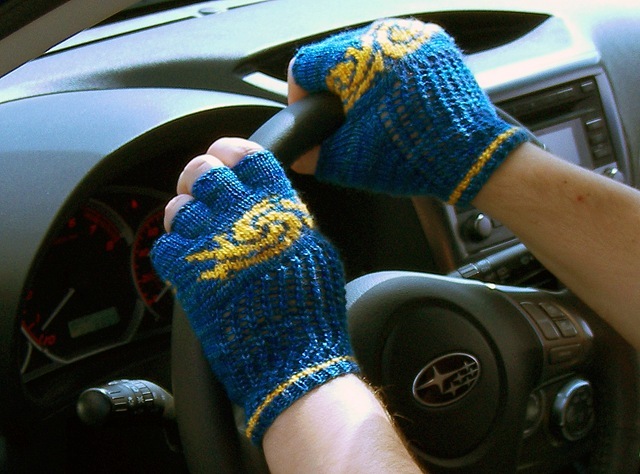 The increases for the left thumb gusset are correct, though. The increases on both gloves lean away from the thumb. If you hold up your hand, palm facing, you can see that an increase leaning away from your thumb has to lean to the right. If the left glove were worked the same as the right hand across the back towards the thumb and then across the palm, the first increase would be an M1L. But on the left glove, the palm-side of the thumb is worked first, not the back side. Does that make sense? It’s harder to explain in words than I thought! Also (you may have figured this out already), if you’re not doing the color work, you don’t have to do the increases and decreases before and after the color work section. The increases are there to compensate for the lack of stretch in that section. If you’re working the gloves plain, you can just knit those 17 rounds or use the mesh pattern instead (17= increase round, 15 rounds of chart, decrease round).